rec. February 2014, Konzerthaus den Hochschule für Musik, Detmold. 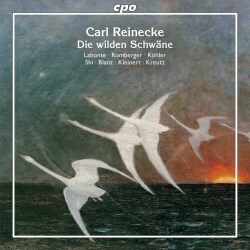 Carl Reinecke served as Kapellmeister of the Leipzig Gewandhaus for thirty-five years. His two piano concerti attracted recorded notice during the Romantic revival of the 1970s, and these and other scores of his have popped up from time to time since. Die wilden Schwäne, based on a Hans Christian Andersen tale, is a curiosity -- basically, a cantata for women’s chorus with piano. Soloists comprise three principals -- one a male voice -- plus, in one scene, two chorus “step-outs.” The fluid, full-bodied piano accompaniments are complete in themselves, but the composer has provided ad libitum parts, used here, for harp, cello, and two horns, which add intensity and contrasting timbres. This score is effective, if somewhat old-fashioned, recalling several of the composer’s more illustrious predecessors. The part-writing for the women’s chorus almost inevitably evokes Mendelssohn -- think ‘Lift thine eyes’, but secular, and exploiting wider registers, as in the Glow-worm chorus. The instrumental wedding march has a folklorish, Weberian sound. The straightforward dignity of the heroine’s “longing” song and the rushing impulse of the Prince’s entrance solo are illustrated in musical gestures familiar from Lieder, a resemblance enhanced by the piano-dominated accompaniments. These produce a pleasing narrative intimacy, though the broad, sometimes melodramatic turns of phrase practically cry out for orchestration -- an observation I made before I saw Peter Kreutz’s similar suggestion in the booklet. CPO’s production is a fine one. The female chorus, which assumes a variety of roles in the narrative -- glow-worms and angels, as well as the eponymous swans -- produces lovely sonority, full-bodied yet clear, under the direction of Hagen Enke. Balances are mostly excellent, although the middle harmonies could be firmer in the lower-lying Glow-worm chorus. The women sound a bit odd in the final scene, when the swans have been transformed back into the heroine’s brothers, but that’s hardly their fault. The soloists are aptly chosen. As the heroine Elfriede, Kirsten Labonte intones her music with a lovely simplicity and a vibrant tone, slightly tremulous at the top of the staff. Gerhild Romberger sings both the Queen’s curse and the Fairy’s instructions presentably, with some pressure intruding on the latter’s high cadence. Markus Köhler’s lyric baritone makes an appropriate Prince, though his highest cadence, too, is tight, and also slightly below pitch. The two soloists in the Chorus of Thrushes have nice voices, but they’re trying too hard. Kreutz, also the pianist, is adept, and the instrumental ensemble is sympathetic. The horns are suitably ominous at the start of the ‘Chor der Lamien’ and solid elsewhere; the cello sometimes contributes sustaining power, sometimes enhances the music’s lyrical element. The sound is good. The engineers have separated the two leads in the finale, with a hint -- but only a hint -- of an early-stereo “ping-pong” effect. The piano tone projects clearly, but with a “digital” lack of depth that, I suspect, does not inhere in the actual playing.